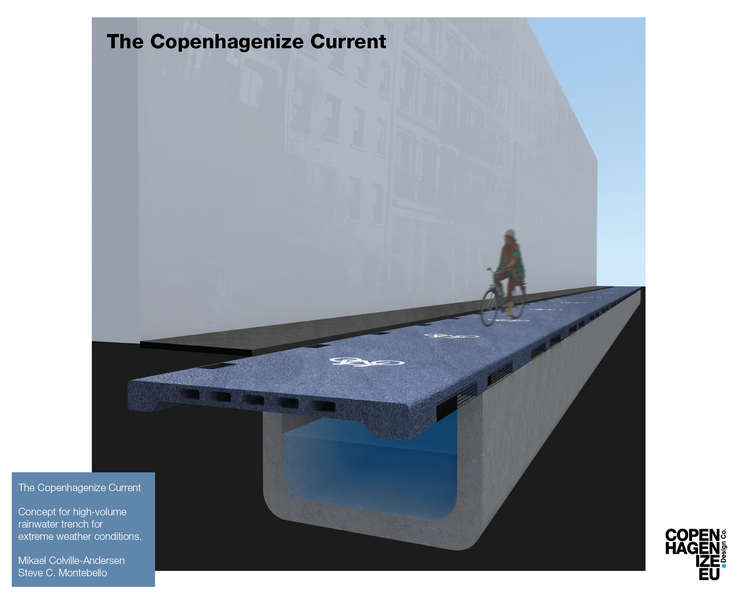 Copenhagenize Current — Copenhagenize Design Co. The city of Copenhagen suffers from torrential rain that our sewers were never designed to handle. What if we use existing space beneath the cycle tracks on main streets in affected areas to create high volume rainwater trenches? After which we cover them with modular, lightweight panels for bicycles to safely roll on. The conceptual model would not be necessary on every street, only on important stretches in high-impact areas, allowing water during cloudbursts to flow freely towards reservoirs and onwards to the harbour.